I purchased my Brother LS2125i with the thought of having a new sewing machine that can perform most of my basic sewing tasks at home without having to pay so much extra for the added features in most sewing machines now that I don’t think I’ll ever need. Here are my thoughts on the machine after less than a year’s time. This sewing machine is full-size but has the benefit of being lightweight and portable, which make sit great for performing alterations or simply every day sewing. It has 10 built-in stitches which include: blind hem, zigzag, and stretch stitches. It also has a free arm and a flat bed, together with a carrying handle, a 3 presser feet, and a built in storage. Its four-step button holes allows forth creating custom-sized button holes that fit your particular buttons of choice. It also allows easy threading, by simply following the diagram on the machine. It also comes with a built-in and free arm for cuffs and sleeves. It’s basically designed to cater to needs in everyday life like sewing and altering sleeves, pant legs, clothing, and more! This sewing machine is 15 x 6 x 11.8 inches and weighs 15.6 lbs. 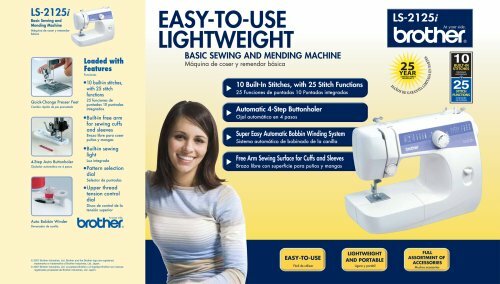 It boasts of being specifically designed for beginners who are looking for a light-weight and no fuss sewing machine that would be perfect for starters that intend to perform clothing alterations and home improvement projects. The device is designed to make the user’s life easier with a foot pedal for controlling operation and stitching speed, bobbin winding, reverse stitching lever, and a tension dial. Switching the included button hole, button sewing, and zipper feet are also made easy. Accessories such as darning plate, twin needle, spool pin, bobbins, a needle pack, 3 presser feet and a compatible screw driver even make using this device much easier. Most of these could fit in the built-in compartment, which would ensure that nothing is left at home in case an emergency project comes along. From my years of using Brother, I have come to trust the brand. It is usually reliable on all the times that I’ve seen it at work, and are also very advanced in the sewing field. This purchase is hard to regret, because it’s a very basic machine, and I think that’s what sets it apart and makes it stand out. Most sewing machines are sold at an expensive rate due to their capacity to perform advanced and complicated stitches that most sewing people don’t even need. It’s good for fueling creativity, but switching from one stitch to another in a machine with 100 stitches isn’t always the easiest task to perform. Aside from its basic functions and good price, it also comes with tons of features and accessories, which is really a good thing. It is lightweight and easy to carry, but a case (preferably hard) would be of help. I used to think that modern and sewing machines that were mostly made for domestic use are never reliable for the task of sewing thick fabric, but this sewing machine is a game changer. I was so surprised that I had been able to cut and stitch my thick denim Levis pants again with this! It’s indeed really surprising. This encouraged me to do and explore more projects, and I will be updating this again if I discover anything that’s surprising again. In the meantime, I really believe that this is one of the best purchases that I’ve ever made, and if you’re thinking twice on buying a good quality, relatively low-priced sewing machine, I encourage you to think again! If you love sewing and home project, I don’t think you could go wrong with this one. I only have one sole problem for this sewing machine, and the fact that a lot of controls are reliant to the pedal. I’ve gotten used to it, but it’s hard to help my younger daughter learn piano further. Each time I bring her to the piano to practice, she always seems to fail to follow the machine’s speed. She can’t exactly control the speed with the pedal, and I’m just so scared that she might end up wounding herself or she might be very frustrated in the end. I would still say that I personally like this sewing machine, so if you’re good and you plan to purchase this, there’s absolutely no need to worry.